In a May 6 Media Research Center item, Scott Whitlock proclaims "the brewing controversy impacting American veterans and a shocking lack of access to hospital care" to be a "a Barack Obama scandal" -- despite the utter lack of evience of any personal involvement by the president -- further huffing that the media is somehow "censoring" this. 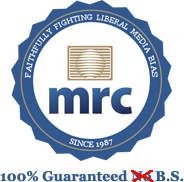 But the MRC sang a different tune about another scandal involving the care of veterans when it occurred under a Republican president. In a March 2007 MRC item, Brent Baker fretted over a report on substandard treatment at the Walter Reed Medical Center, which stated that "the White House is well aware of the PR nightmare that it faces. The last thing this administration can afford is another Katrina." That's one of the very few direct mentions of the Walter Reed scandal you'll find at the MRC, demonstrating that it's no stranger to the censorship it accuses others of conducting.